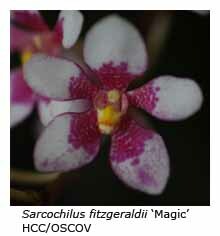 Sarcochilus hartmannii and S. fitzgeraldii are the most easily grown members of the genus Sarcochilus in Australia. Within Australia the genus extends from northern Tasmania in a coastal strip that reaches to the tip of Cape York. Other species are found in New Guinea and on some islands in the Pacific Ocean. 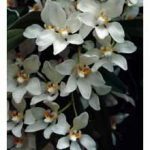 Not all 15 Australian species are amenable to cultivation but S. hartmannii, S. fitzgeraldii and most of their hybrids are easy to grow and flower in southern Australia, and are very popular with hobby growers. 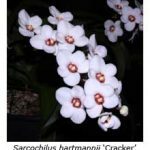 These cool- to cold-growing orchids make ideal companion plants for cymbidiums, although keen “sarc” growers prefer to say that cymbidiums make ideal companions for their sarcochilus plants! Both the above species are basically lithophytic, growing with their roots either attached to rock surfaces or buried in leaf litter in cracks or crevices in the rocks. However, there is a marked difference between the habitats preferred by the two species. Sarcochilus hartmannii prefers an open situation, where it can enjoy full exposure to sunshine for most of the day, and where it is exposed to strong winds and a relatively dry environment. Its range extends from the central NSW coast to southern Queensland, usually at elevations above 1000 m, where it experiences conditions ranging from cold nights to very hot days. Sarcochilus fitzgeraldii prefers much more humid conditions. 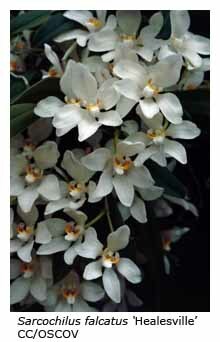 Commonly called the Ravine Orchid, it is found in the wet, humid ravines of the Great Dividing Range, where waterfalls cascade from the tablelands. Its roots, like those of S. hartmannii, cling to the rocks or creep into humus-filled crevices in those rocks but it relishes the constant movement of cool air through the deep, damp ravines. Both species are monopodial plants that grow into large specimen plants by producing offset growths (keikis) from or at the base of the original growth. 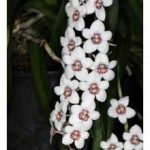 Sarcochilus hartmannii is probably the more popular of the two, because of its ease of cultivation and its reliable flowering habit. Its racemes are produced from the leaf axils. Although the peduncle (the stem below the first flower) is quite long, it may support as many as 25 flowers in an upright or arching manner. 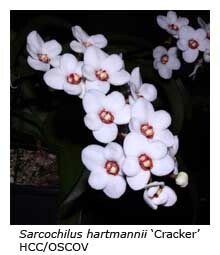 Its flowers are always white (the so-called “southern form” of S. hartmannii, which has off-white or cream flowers, is now known as S. aequalis), although the centre of the flower often bears yellow, brown or red spots or blotches; there is also an all-white (alba) form. The flowers range from 10-30 mm in diameter and are circular in outline and well “filled-in”. In some cases they tend to bunch at the end of the raceme. Sarcochilus fitzgeraldii usually has larger, more open flowers that may measure as much as 40 mm in diameter. Its racemes are usually longer than those of S. hartmannii and, because of their larger (but fewer) flowers, tend to be more pendulous. Flower colour varies considerably, from a pure white form to one that is all red. However, in general their flowers are white with varying amounts of red or pink in their centres. 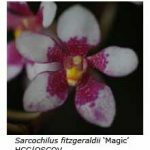 Sarcochilus Fitzhart, the popular hybrid between the two species, produces its flowers in a wide range of size and colour. Although most of the progeny show some characteristics of each parent, the cultural preferences of S. hartmannii predominate. My sarcochilus plants receive plenty of light, although grown under light shade. They grow well under the protection of the leaves of my cymbidiums. 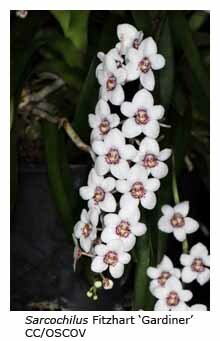 Although they don’t receive as much water as the cymbidiums, the atmosphere is always humid. I now sit their pots on pieces of wet carpet, which release their moisture to the plant continually over a day or two. My preferred potting mix consists of 5 parts of medium-grade pine bark, 3 parts of quartz stone (5-12 mm in diameter), and 2 parts of shredded bush litter from which the humus and other fine material has been removed by sieving. I also add a handful of charcoal to each bucketful of mix. This formula provides a mix that drains perfectly yet still holds enough moisture to maintain a happy root system. I water the plants once or twice each week in summer but only once a month in winter. Liquid fertilisers are applied occasionally, weak and seldom being my motto!